Courtesy Andreas Fichtner, ETH Zurich. Like a vibrating bell, the Earth is constantly in motion, emitting hums and whistles. Although there is still a debate about what's causing these sounds, their sources have now been mapped by researchers using the Piz Daint supercomputer. There's more to seismology than tracking earthquakes. Earth also emits steady background seismic noises. Piz Daint supercomputer paints picture from 10 years of recorded earth sounds. Stomp, please! That is the request made in Focus Terra, the Earth Sciences Museum of ETH Zurich. As you stomp, a nearby seismometer instantly measures the seismic waves triggered by the shock as they pass through the floor. Some seismic waves — from an earthquake, for example — are powerful enough that they can propagate to all corners of the globe. Seismologists listened into these seismic waves to create a three-dimensional tomographic image of the Earth’s crust similar to a computed tomography for a human being. Using the Piz Daint supercomputer, they came up with some revealing images of the Earth’s interior. To look underground, seismologists use seismic waves generated by man-made explosions or natural shocks. The most obvious natural sources are earthquakes. But there are also weak, continuously active sources of seismic waves, registered by seismometers as steady background noise. This data is used, for example, to monitor day-to-day development of an oil-producing petroleum reservoir, says Andreas Fichtner, professor at the ETH Institute of Geophysics. However, some of these natural wave sources shift position daily. “This movement of the sources means that we ‘see’ the subsurface differently each day,” says Fichtner. “So it is not absolutely clear what has changed: the reservoir, or just the image of the subsurface." To mitigate this challenge, Fichtner and his team developed a numerical method to accurately monitor the subsurface. With it they sought to identify the positions of the seismic sources and thus eliminate errors in the tomographic imaging. Almost incidentally, the researchers gained amazing insights into those sources along with new information concerning the origins of seismic background noise. The researchers used this new method on the Piz Daint supercomputer at the Swiss National Supercomputing Centre and processed an enormous data set obtained from 100 seismometers from around the world. The seismometers recorded every ground movement around the Earth at intervals of one second over a ten-year period. From these, the scientists used the seismic background noise generated by two different kinds of seismic wave from continuously active sources. Both are weak: They cause ground movements of just a few micrometers, imperceptible to humans. One wave (called noise) oscillates at higher frequencies, with short periods ranging between 7 and 14 seconds. The result is a sort of whistle. The other wave (called hum) oscillates at low frequency with long periods of 100 seconds or more. “The hum acts like a low-pitched bell that swings steadily from constant striking,” says Fichtner. Its oscillation periods are so long that the whole Earth — with its one trillion (ten followed by 21 zeros) cubic meters volume and a mass of 6 trillion kilograms — oscillates in response. The researchers then correlated individual seismometer records with those of all the others. “With such minuscule waves, we need huge amounts of data in order to obtain statistically significant results — that would not be doable without supercomputers,” Fichtner notes. From the resulting correlation functions they finally calculated the distribution of noise and hum sources. “Simply put, we were able to reconstruct the sources from differences between the amplitudes recorded by the seismometers,” says Fichtner. After the supercomputer had calculated the positions of the hum sources, the scientists printed monthly maps of them. Surprisingly, not only did a certain order emerge from the chaos, but there was also a strong year on year resemblance between the maps for each month. 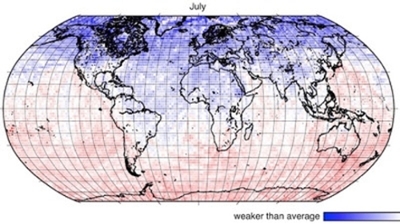 As shown by a previous study, the hum and noise sources migrate with the seasons. Now, researchers were able to show that hum sources are unevenly distributed: They are stronger in the oceans — especially the Pacific — than on the continents. 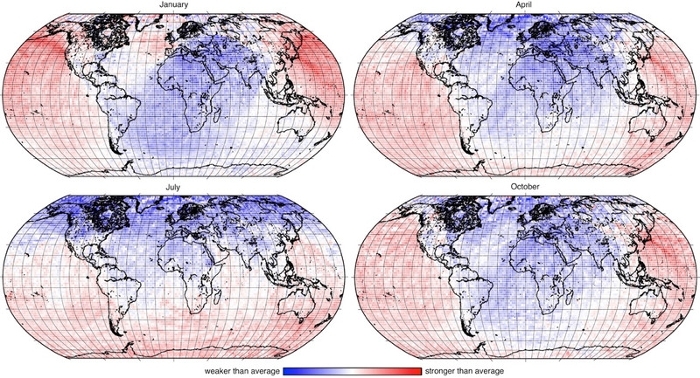 Exceptions are strong continental sources in East Asia and Australia, and weak ones in the Atlantic, the researchers write in their study, recently published in the Geophysical Journal. Scientists have known for about a decade that the noise comes from the ceaseless swell of the world’s oceans, like a seismic source rocking the seabed. Indeed, if you stand on a beach and observe the waves, they hit the shore at intervals between 7 and 14 seconds, Fichtner says. Just how the hum arises is not yet clear, though. Some researchers posit that such signals could be generated when ocean waves with long periods meet continental slopes or pass by oceanic obstacles. But they're also considering sources like atmospheric turbulence and wide-area fluctuations in air pressure that create a resonance between the atmosphere and the ground, which is then perceived as hum. “Our study shows no clear signature for either ocean or continent,” Fichtner notes. So for the researchers it is evident that the origin can neither be purely oceanic, nor purely continental, and that in turn could argue for an atmospheric effect. Looking ahead, the earth scientists want to include much more data and refine their method. (It does not currently take into consideration the Earth’s three-dimensional structure, since the method and its underlying theory were intentionally simplified.) While there is progress to be made, by using the new method, and taking into account the exact positions of the seismic sources, the scientists can now rapidly create an accurate picture of our planet’s subsurface.